Toshiba is again taking the notebook computer to the next level by introducing the Qosmio G45-AV680, their first US notebook with an HD-DVD drive and the capability to play 1080p high definition videos. The Qosmio G45-AV680's HD-DVD optical drive does not only play HD-DVD but it also has the capability to record 30 GB of data unto an HD-DVD disc. Specifications of the Qosmio G45-AV680 include an Intel Core 2 Duo T7300 processor with speed of 2.0 GHz, 4 MB L2 cache, and 800 MHz FSB, 2048MB PC2-5300 DDR2 SDRAM memory, two serial-ATA hard disk drives with 160 GB capacity each, HD DVD-R/DVD SuperMulti optical drive, USB HDTV Tuner, 17 inch diagonal widescreen display, NVIDIA GeForce 8600 GT with 512MB DDR2 PCI-Express graphics card, four built-in Harman Kardon Bass Reflex stereo speakers, Intel Wireless WiFi link, remote control, built-in fingerprint reader, webcam and microphone. 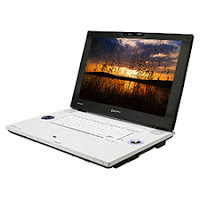 Toshiba's Qosmio Qosmio G45-AV680 takes multimedia notebook computing to the next level. The ample 360 GB hard disk drives and ability to expand to 30 GB with the HD-DVD optical drive will allow users to save high definition videos or their entire photo albums or music libraries unto their notebook. Users can also enjoy their favorite HD DVD movies or high definition home videos on the Qosmio G45-AV680 since the 17 inch diagonal widescreen display supports 1920 x 1200 native resolution and 1080p content, making the Qosmio G45-AV680 the ultimate portable home theater.